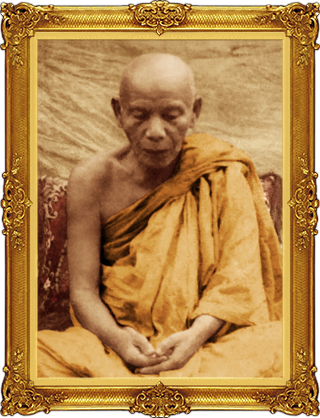 Luang Phor Klai (Phor Tan Klai) was born on 1876 (BE 2419). When he was 14 years old, an incident happen when he and his uncle chop firewood, the tree fell and shatter his left leg. He had trouble walking and need the aid of his water buffalo. Phor Tan Klai was ordained at the age of 15 and by the age of 26 he become the Abbot of Wat Suan Khan. Whatever he said or predicted would often come true, that is how he gained the title of "Golden Mouth Monk" by many. During his time, Luang Phor Klai was one of the Kings most respected monks in southern Thailand. He passed away on 1970 (BE 2513) at the age of 94 and like many great guru monks his body was undecayed.